Gone are the days when you had to march round a hall for what seemed like hours on end to train your dog. Those bad ole days when we were instructed to practice only whole exercises instead of breaking them down into tiny component steps. No longer do you have to prepare a training session like a military campaign, getting everything in place before you fetch your controlled and manipulated dog from the white room he’d been placed in so that he didn’t get too excited/bored/whatever. You don’t have to take copious notes on what you do in every session. Note-taking certainly has a place, and if you’re a professional animal trainer, working with a host of different animals every day, it’s a must. But for the average dog-owner, with just one dog to work with, you should know what you last did and how to progress it next. 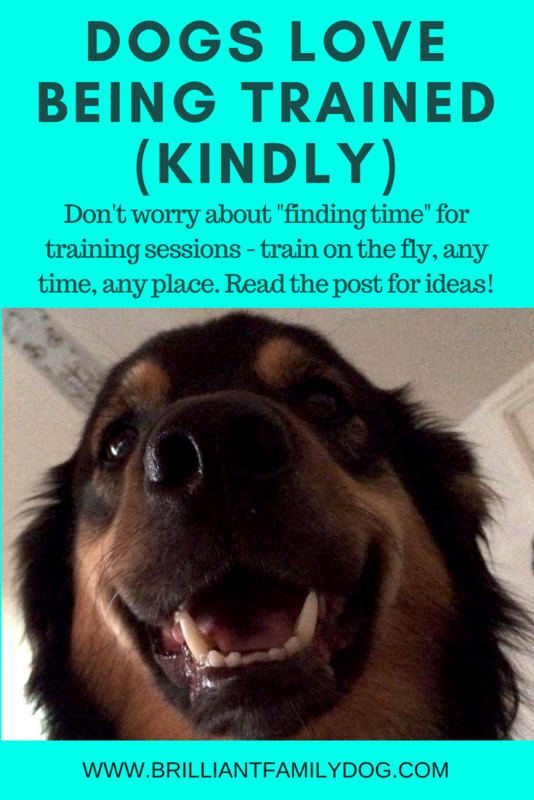 Most of my training is done on the fly, as part of my everyday life with my dogs. First thing in the morning, for instance, my dogs are released from their beds to give a delightful morning greeting. Here’s Lacy’s morning smile to me, leaning over my pillow … What could be nicer? Straight downstairs and they all sit at the garden door waiting for it to open and to be let out by name, individually. So already we’ve used matwork, impulse control, turn-taking, and waiting for - and acting on - a personal release cue. These all have their own intrinsic rewards - no need for treats or toys. While the others do their business, Rollo will be too busy watching the hens emerging from their house for another day of clucking and scratching. His “Hurry up” cue sends him straight to the pee-side of the garden for some action. Back inside again, they are free to greet the cat, keep me company getting ready for the day, to chew bones, lie on their beds - generally amuse themselves. So that takes more impulse control, self-confidence, feeling comfortable in their own skins. And so it goes on, through the day. While I work they can do what they like. An off-switch is an essential here! Preparing for a walk or van-journey incorporates impulse control and patterning. A visit to the shops or cafe brings in more of their everyday training. Here’s Coco on his mat at the coffee shop, waiting for victims to come through the door to greet him (so he thinks). More matwork, more impulse control, polite greetings. Once we’re out we either have an exploring walk, or play with toys (each dog has their own toy so that there aren’t any mid-air collisions or spats), and the two that have difficulty with things suddenly happening - strange dogs, people, children, bikes, plastic bags, or hot air balloons - get to work on their reactivity with carefully-designed strategies for them to adopt instead of barking, lunging, and shrieking. I help them cope with the hazard, then on we go again. Here we’ll have used a number of reactivity-geared techniques, counter-conditioning, recall, loose lead walking, retrieve, stop mid-hurtle, down, sit, and any other tricks I fancy asking for. I’ll walk one, two, three, or four, dogs as the fancy takes me, and as the need arises. Multiple dogs in a home can soon turn into a gang of hoodlums if their individual needs aren’t catered for. Those recalls, for instance, aren’t something you teach by telling your dog to sit, marching away, facing him like a statue, then barking out a command for him to come to this imposing figure, and sit. Life is not an army camp! And your wayward dog is not going to learn by you just yelling at him when he’s a couple of hundred yards away, hoping that somehow, miraculously, he’ll understand what’s wanted. When I call my dog I want him to respond to me with a “Hey! That’s my name!”, a head-turn towards me (a stop and turn if they’re racing away), whole-body turn - then a race towards me where they’ll be greeted not with a stony face, but with joy. No requirement to sit - just to race back. So each of those parts is taught entirely separately, and only occasionally put together as a whole. And each of those parts is practiced in isolation, regularly. Yes there are little impromptu training sessions dotted about the day, one dog at a time, while the others wait their turns on their beds - or perhaps all at once to see who’s listening! And when I’m teaching a completely new skill - scentwork (in the photo Lacy is searching a car for contraband), teaching them their sign to give consent when I want to handle or groom them, fun things like stacking beakers or dinner bowls, fetching and carrying things for me, formal obedience stuff, like Sendaway or dressage-style Heelwork - these will be slightly more planned, but still slotted in for a minute or two here or there. In the back of my mind I know what I want to achieve, and what small steps need to be taken to get to the desired result. Then I just peg away at it when we are all in the mood. We don’t line our children up in the morning and give them a ten-minute lesson on what we want them to learn, then ignore them for the rest of the day! We interact with them all day long - a word here, a story there, a little advice or teaching slid in to a conversation, appreciation for something they’ve done which pleases us. We don’t need to allocate special time for all this - it all happens as the day unfolds, during the time we are already spending with them. And that’s what happens with my dogs here. A frequent note to self that “What you expect is what you get,” ensures that I keep the training going at all times - although to my dogs it’s just daily life, interaction with me and each other, cuddles, food, fun. This is what I call “All-Day Training” - just bits, slotted in here and there. How many people have a dog of eight or ten years old, and say - “Oh, Harry never comes back when he’s called,” as if somehow it’s Harry’s fault that they never took the time to teach him! It’s never too late to teach your dog skills that not only may save his life, but which make daily life so much more congenial. If you wait till the time is right, all your ducks are in a row, and you are going to “do some training”, you’ll have missed the boat. Full of care, you’ll have missed out on the squirrels and the stars, and the smile in the eyes. Forget about formal sessions. Forget about sits and downs and marching about on a lead. Stick to All-Day Training and see how easy it is. If you want to find out how to break things down and teach one minute at a time, check out my Online Courses, and my step-by-step books. Develop the bond between you and your dog, enjoy watching him blossom as you work together, and things will all pan out very nicely.